“The forecast was so good, it was too good to be true” someone said and thats exactly how it worked. The early risers got about 30 minutes apiece in the frontal push at 10am… then, against all forecasts, the wind locked in NNW instead of NE. NNW is about 90 degrees off good. Sam got a picture of my 2nd flight. 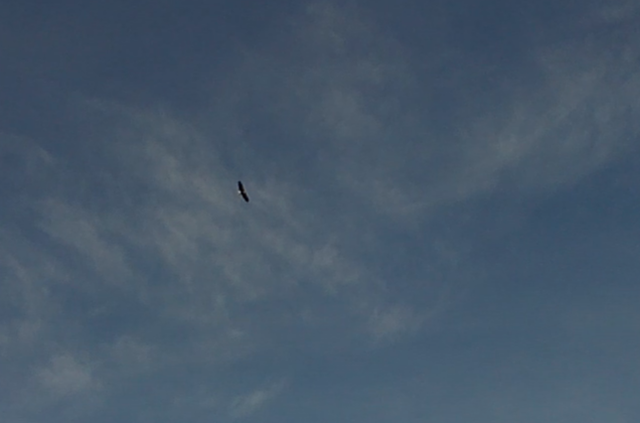 This bald eagle came soaring over us. Looking down from his throne as the last of the PG’s had sunk out from the morning session. The king. Soaring the NW face in rolling, rotory ridge lift. The best ridge lift was pretty close to the hill, but that’s where the biggest rotor surprises were too. I’m guessing the compression of the already rolling lee-side air against the NNW face was making the roller coaster more pronounced. 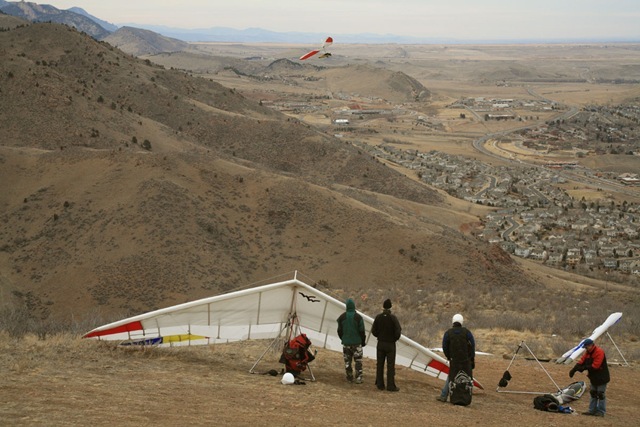 On both flights, as soon as I I got below the launch, it got too wierd to be next to the hill. School bus size parcels of air that were rolling around each other making nice 400fpm up spots, but I couldn’t stay in them. The video show’s a steep turn and yawing all over the place as I fell with a bus and then rose quickly on top of the next bus. 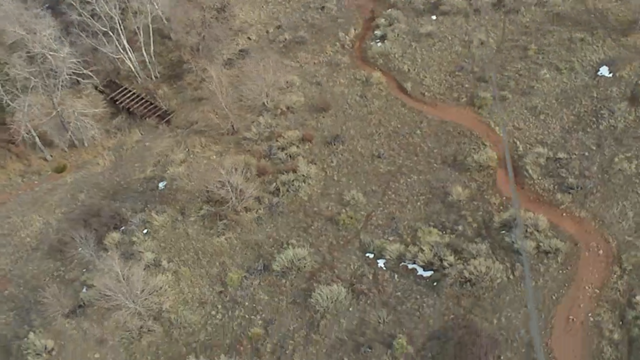 Rolled up looking sideways down at a bridge and the Chimney Gulch trail. 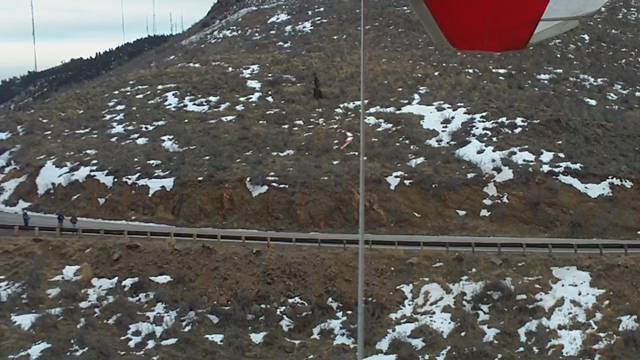 Both landings are on the video and are sporty. Both in strong downwind conditions. 7-10mph I’m guessing? For the first, I went to the hill behind the trees (see below picture) b/c I knew I’d have better chances not overshooting. Worked great. 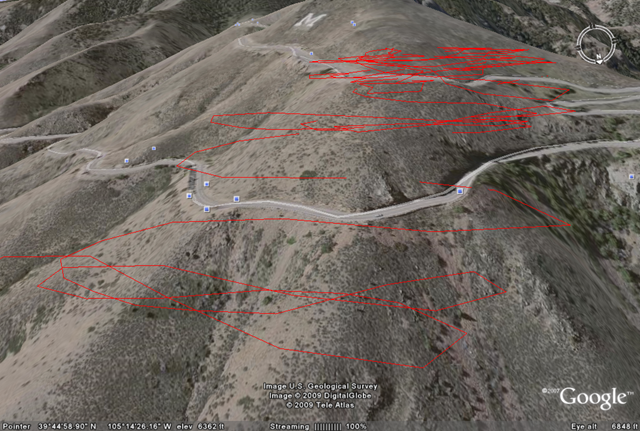 I’ve been wanting to practice dnwind uphill landings anyway. 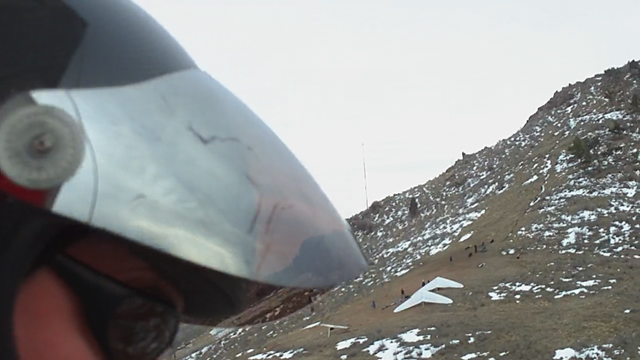 On the second landing, I went for the familiar LZ and the video show’s how fast I was coming in! It’s great having these video’s to review from a couch. The wife was wondering if I was getting nutz again since the other 5 HG’s didn’t fly and I flew twice. I know guys have gotten away with even a lot more than me in the old days, but it deserved some thought. On both of my flights, I had planned to experiment with top landings by coming up the normal launch, which I think would have been safer than the normal LZ believe it or not. 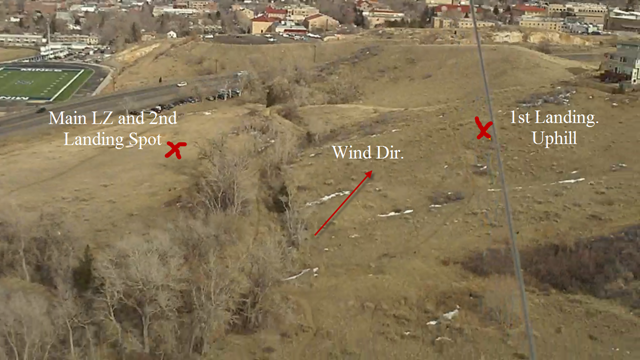 But I was ok with putting myself in these “probable” dnwind landing conditions below. I hadn’t gone into tunnel vision on the top landings too much and tunnel vision is when I’ve hurt myself before. Launching was easy too when that rare thermal would bring the wind up in the right direction so that wasn’t an issue. And I knew ahead of time that the washing machine air was out there b/c I’d done this once before, so at least it was on purpose and not as scary this way. This Sport2 really doesn’t care what the wind is doing. A cool thing to remember on landing came to me on the second flare. I think the lizard brain knows now, when the ground is going by way faster than it usually does, a great forward-stopping flare is mandatory. It’s counter intuitive, but a huge amount of extra flare authority comes from arching your back and lifting your legs up towards the keel as your hands push the control bar forward and up. Counter intuitive b/c at flare time, you want to make your legs go under you, but this is the opposite… It’s a trust thing. Thanks to the mentors and Mark Windsheimer of Airtime Above HG always having new things to try like that. I love that they’re getting instinctual.. One thing at a time. We turned the sprogs down one full turn (from stock) on launch and during the second flight I could really tell a difference. I initiated a turn just by squeezing my right hand fingers into my palm and that couple inches did it. What a difference, not having to use lots of force, or not having to pull in a bunch to get speed before turning. Really looking forward to the lighter handling! b-bye sticky turns! If I had any doubts in my currency, landings, glider, storms, tunnel vision, new equipment, whatever, I wouldn’t have flown. I wish I had a brain activity chart for the grey matter when I was drawing those brand new approach routes in that turbulent dnwind air. No regrets, and good learning came from it. This is turning into a “thoughts by Jack Handy” skit from Saturday Night Live. Here’s to Red Bull, avoiding intermediate syndrome, and rich moments!